Flicker 2D series units are compact single channel flicker units. The 16 different selectable programs in an integrated circuit memory provide automatic random or regular changing light. The Flicker 2D2K units have 16 selectable effects. The effects are selected by setting the 4 effects switches either on or off. This 4 by 4 "matrix" allows 16 possible combinations of the switches. They can be changed during operation if desired without causing any apparent glitches in the program. High resolution flicker for several level changes, not just an up down flicker. When the low dimmer level is set and the effects are enabled via the on button, the high dimmer level becomes active. Action (flicker, etc.) takes place between these two settings for subtle or dramatic effect. Speed control is extremely wide range from nearly stopped to very fast. Several of the programs are digital samples of actual events including: firelight, candles, TV sets, movie screens, lightning, and many other changing light sources. On/off buttons allow manual flicker. Operates as dimmer only without flicker effect if desired. Interface output DIRECTLY DRIVES OUR DIMMERS. Drives several at one time. 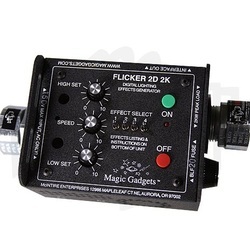 Flicker 2D 2K standard configuration features color coded tactile feedback on, off/reset buttons, low dimmer and high dimmer level controls, flicker delay (speed control) knob, BLF type fuse, 4 toggle switches for (16) effect selection, ground and output activity indicators, u-ground ac power connectors. 120 volt ac input, 50/60 hz, maximum peak load limit exceeds connector capability, size appx. 2x3x4".